It’s nearly holiday cooking season and if you read Jodene Shaw’s feature on the Women in Agriculture series, you know I am sharing my favorite Lodge Cast-Iron Dutch Ovens with two fabulous folks this weekend. Not the actual ones in my kitchen that I cook with just about daily. New in the box, just for you, purchased by me from our family owned lumberyard. There’s a 6 quart red one and a 7.5 quart blue one. The enamel coating cooks and cleans beautifully. Both are BIG and ready to host a family gathering or two or fifty. Or if you win and aren’t a cast-iron cook in the kitchen, you have yourself a fantastic gift to share! Enter below with multiple entry options. Comment below with an answer to “What is your center of your life?” No wrong answers. 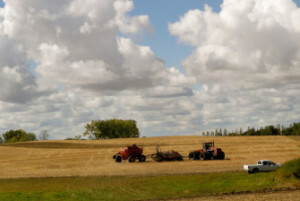 My faith and family is the center of my life on the North Dakota prairie. Cooking for them and eating together is a big part of our conversation time together. And let’s be honest? Laundry is also at the center of my life. Enjoy! I’ll announce winners early Monday morning on my Facebook page. Working on finding my center.. but as I move through more seasons in life, I get closer to realizing what it is that drives me and guides me! My family is the center. And I too love to cook & bake for them! My husband and my kids are the center of my life. The center of my life – husband, children, family, friends – and gathering in our kitchen is where memories are made. My husband has a great quote in his office which sums it up well: Faith, Family, Friends, Baseball! The center of my life is my family, friends, and livestock. With out the combination of the three life wouldn’t be complete. Weather having a bad or good day they all support you everyday. Another important thing is cooking I love cooking and making new family memories around food. It seems to a constant change of motion, but definitely my family is the focal point. Along with supporting all that we are involved in that is all associated with agriculture in our rural area along with at a national level. my girls, 3.5 and almost 5, everything revolves around them! My family is the center of my life. Faith and vocation are as well. Family is the center to my life,, they are there to share in all the goodness that God has given us,, as well as those times of sadness, as we share our memories of those that are no longer with us.. We work together, play together,, and are there for each other. As we sit around our table the words flow freely, and we all get a glimps of each others lives.. I would have to go with my faith and family too! Jesus, My husband, and family, and close friends are the centers of my world! And they make my world a better place! So many thing going on in my life, it is easy to get distracted by all the “stuff” going on. At the end of the day my family is what brings me the most joy. I have 2 healthy beautiful rambunctious children. My center is Faith and Family. I would like to say that Jesus and my family is at the center of my life every day, but honestly, I think that that’s really difficult and doesn’t always happen, sometimes I’m selfish, and I make it about myself- I keep trying though! My kids and my husband and God are my center. My sons , cooking, and sewing are at the center of my life. I can use one of these! I don’t have one and needed one last week. My faith in Christ is my center; immediately following are my husband, my 10-mo. old daughter and our cattle business. Wherever my husband is, I am centered. The center of my life is my family. They keep me grounded but also encouraged to keep living and loving life! The center of my life would be my husband and kids. They are what makes everyday worth living for. My Kids and family. And driving. 40 mile commute one way for school and home games are an hour away. When i am home I love to cook for my family and Katie your right the best conversation is around the table. My family has been my center and I am so thankful for my kids. Faith and Family, which when celebrating both is surrounded by Food! my center…………first is my God and then is my husband. When I need to refocus, I either recite a prayer or call my husband. I also LOVE being in my house on my farm! Faith, family, friends, and food. My family and faith are my center. They fill my cup more than anything! Definitely my family, especially my husband! My family and home are the center of my life. My faith is my center here on the rolling plains of Nebraska. My vocation is my marriage & family. I usually have a pot simmering or a pan roasting & would love, love, love to win one of these beauties! Definitely my family, and I love how food brings our family together. I am currently waiting for gingerbread cookies to set so I’ll have a freezer full when all our out of state cousins come at Christmas time. ps. I that Jolene has a turquoise Pinterest board! The centre of my life? Food. When I’m prepping three healthy, hearty meals a day for my family it means my schedule is in check (I’m not working too much and serving them frozen pizza three times a week!) and my priorities are in balance. If my family’s health is taken care of first, everything else seems to fall into place!! My family and God are definitely the center of our lives. My family is the center – my hubby and our baby girl! My family and their happiness is the my center of everything. God is the center of my life! What is your center of my life? Serenity as inspired by 12-Step Living! Being mom. Everything else is part time! God and family. Easy answer. Nothing more important than people – my family!! The center of my life is God, family and my farm animals. Love those pesky critters! Love and laughter are the center of my life! My family and friends fill me with both! Jesus Christ my personal savior 1st and my crazy wonderful family. Gathering together ALWAYS involves food and laughter! My family is deceased and I don’t have pets at the moment, so I’d have to say friends, especially my bestie. Faith, family and the farm! Nothing else matters! My children Are the center of my life. God and family is my center of life. Thanks for the great giveaway! Ha! Laundry. Yes. That and my kids. They are inseparable. A couple other thoughts. 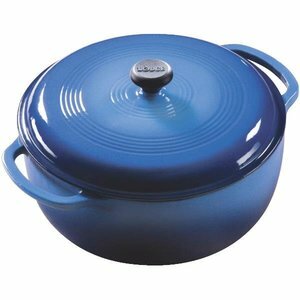 1 – I have always wanted a Dutch Oven. 2 – If my husband saw that I had typed that phrase, my life would be horrendous 3- It would be the MOST awesome if I won this and you delivered it because you have yet to meet Ella Jayne. That is all. Mwah. The center of my life is my wife. She’s currently in the other room planning her thanksgiving day menu and black Friday doin shopping plan. My Husband and my dogs! Right now, life revolves around breastfeeding. Family and our family is the center of my universe! The center of my life is God and family! The Lord Jesus Christ is the center of my life, and all good gifts come from the Father above. The gift of my family is truly a blessing! Family — both blood and found! God, Family and Friends are the center of my life. My faith, my family, and being helpful and kind to others.